Title : Germania Parte Occidentale, Dedicata Al Reuerendissimo Padre D. Serafino Pasolino Nella Congreg Lateranense …. Map maker : CORONELLI, V.
Size : 30.0 x 20.5 inches. / 76.2 x 52.0 cm. 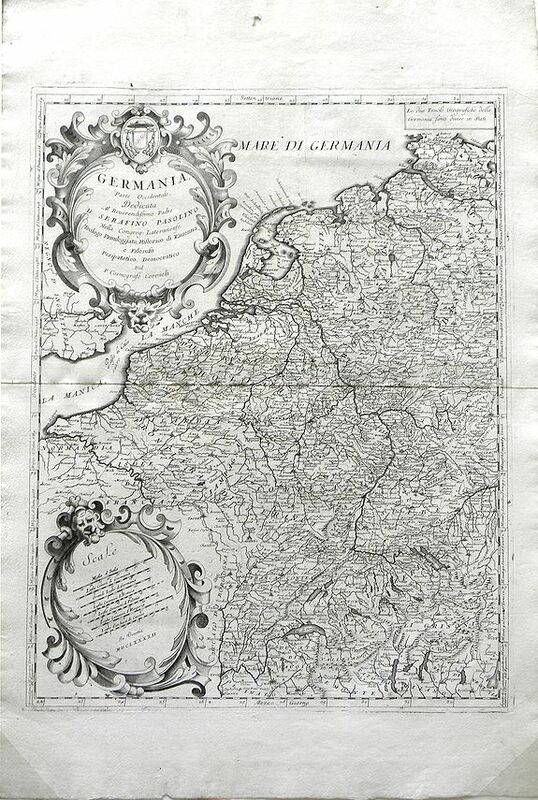 Description :Detailed map of Western Europe by Vincenzo Coronelli, showing the western portion of the Holy Roman Empire. Includes regions of northern Italy, Switzerland, France, Belgium, the Netherlands and Germany. The French region of Normandy is in the eastern section of the map, the towns of Lyon, France to Como and Brescia, Italy, are shown along the lower portion, and the towns of Ulm, Rotenberg, Gottingen and Lubeck, Germany are shown along the east edge. A decorative title cartouche is at the upper left corner, and an additional cartouche with a distance key is at the bottom left. The map is dedicated to Serafino Pasolino, an Italian abbot. Accompanying text with 2 town view illustrations of Kiel, Germany and the Island of Gotland, Sweden are on the verso. This is the left portion of a two part map, the other portion of this map is listed in the auction as well. Condition : Some wrinkling and discoloration along left edge. A small puncture, approximately 1/2 inch in diameter, is in the top paper margin.